30" x 42" sheets: Self-contained steel C-Files® have integral cap and can be bolted together for stacking. ; Drawers have front metal plan depressor and rear hood to keep documents flat and orderly. (Dust covers optional.) ; High base designed to support one file. ; Drawer pulls are chrome. 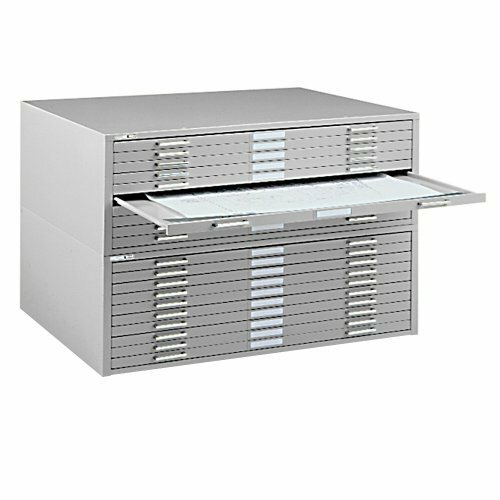 ; Units support up to 100 sheets per drawer. Specifications: Inside Drawer: 43" W x 32 3/4" D x 5/8" H ; Overall: 46 3/4" W x 35 3/8" D x 15 3/8" H . Available Paint Finishes: Sand Beige ; White ; Black ; Gray.